Don’t panic—this isn’t going to be one of those six degrees posts. Not in the mood. Actually no reason for this post at all except that something I read sent me on a pleasant ten minute architectural journey through google. So, Just a few pretty pictures, and hey, if there are a few connections made along the way, well, I just can’t help myself. Here is how a wandering mind spends ten minutes in its travels. While reading Robert Becker’s biography of Nancy Lancaster earlier this week, I was struck, by Mrs. Lancaster’s description of her first sight of Eydon Hall, soon to be the home of her Aunt and Uncle Phyllis and Robert Brand. She was reminded, as ever she was, of her native Virginia, and in particular, of Bremo, the Cocke family estate in Fluvanna County. 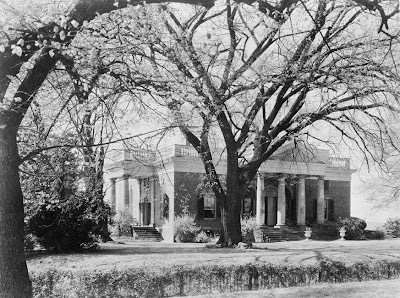 She considered it the most beautiful house in Virginia. I first saw a photo of the house when I was 12 or so, in Richard Pratt’s Treasury of Early American Houses. An arrow went through my heart, and has remained lodged there every since. 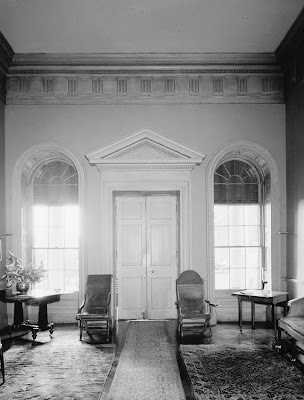 Never had I seen such purity, and such a perfect balance between elegance and neglect—my New England childhood, much as did Mrs. Lancaster’s Virginia childhood, left me with a permanent taste for architectural and decorative purity with a dollop of faded on the side. Unfortunately, it did not leave me with either Mrs. Lancaster’s talent for putting together a room, nor her talent for rich husbands—but, that’s another story. On with the photographic ramble. 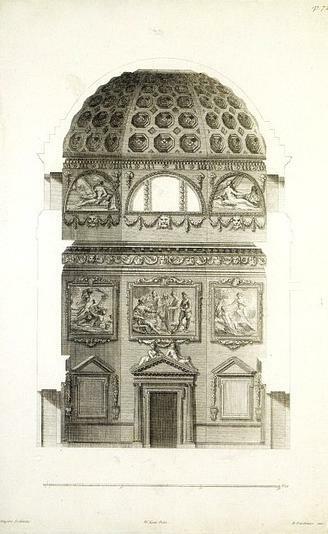 But I snapped back as I thought about that Englishman, Lord Burlington, who so famously embraced Palladianism for the design of his own domed villa at Chiswick in the early 18th century. Palladian though Chiswick and Monticello may be, they owe great design debt to the sublime Villa Rocca Pisana designed by Scammozi The beauty of the rotunda at Rocca Pisana strikes me speechless. Another English house, Nuthall Temple designed by Wright of Nottingham (no relation to Wright of Chicago), also took inspiration from La Rocca Pisana, and its rotunda too strikes me speechless, although in a very different way. Busy, busy, busy. 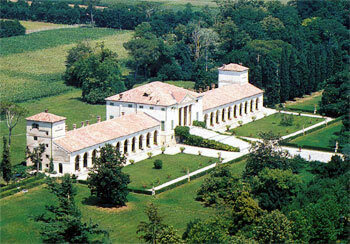 Villa Rotonda led me back to England, to Mereworth Castle in Kent, that most English take on La Rotonda, designed by Colin Campbell. 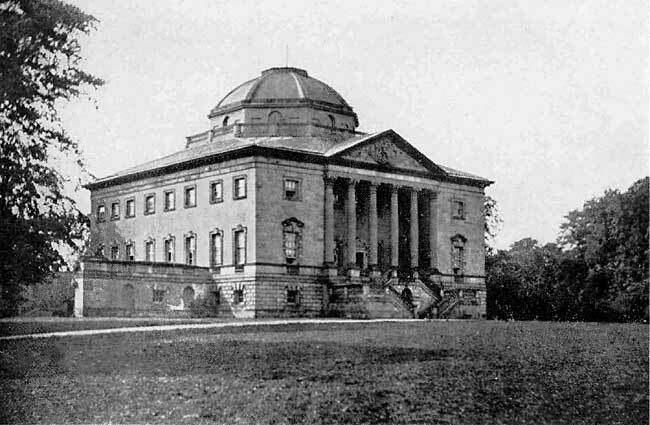 Mereworth Castle was owned for a time by Michael Tree, who inherited it from his step-grandfather, Lord Beatty. Tree’s mother, Nancy Lancaster, kindly redecorated it for him. I couldn’t achieve a color photo of the rotunda, where Lancaster brought Italy to England with color, a rich salmon terra cotta. And with that, we’ve come full Rotonda. >As much as I appreciate decoration, it is really form and proportion that rule, even (or especially) on a small scale. I have never visited Bremo, either, but would love to see it after admiring it so long in books. >Coming full rotunda indeed. Bravo!What strikes me most about the Italian Palladians is the stark surrounding of the landscape, which multiplies the effect of the design (simplicity). >I think I'm in love….with a BLOG! AHHHHHHHHHHHHHH!Thank you..
>I blame Nancy Lancaster for everything, but that is a rant for another day. Brilliant, Dilettante, brilliant! 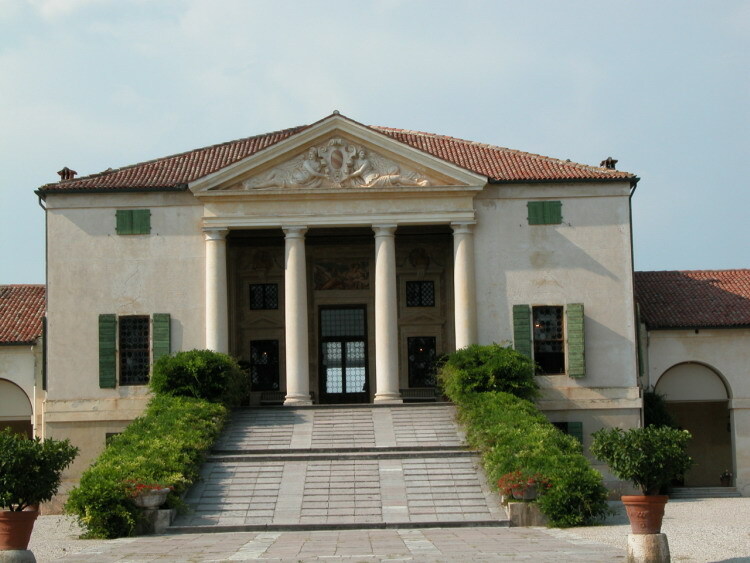 We're planning another trip to Italy in the winter and taking a tour through the Veneto with its Palladio villas, and thereafter tour the English houses would be the ideal. But … time, time, time! 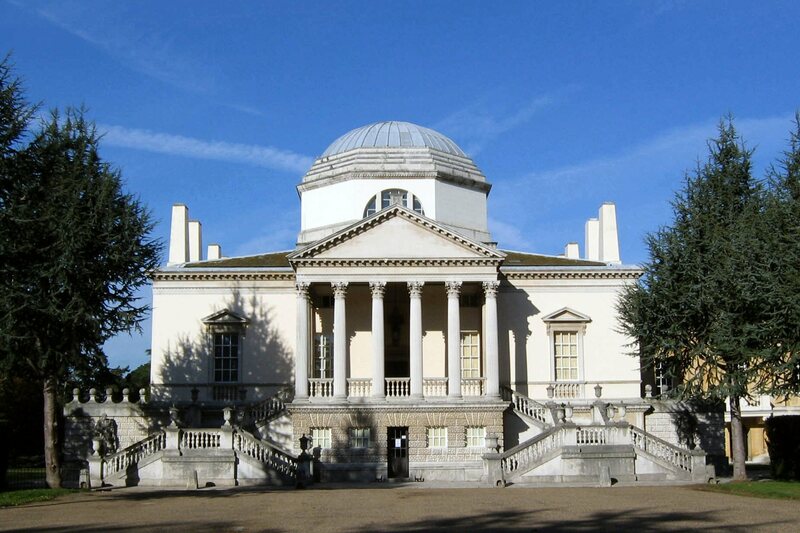 Chiswick House, I got to know quite well when I lived in London but that is thirty years ago. >Thanks so much. Speechless here. >Superb. Those snappy descriptions certainly put a smile on my weary face. And then you gave us Full Rotunda into the bargain. 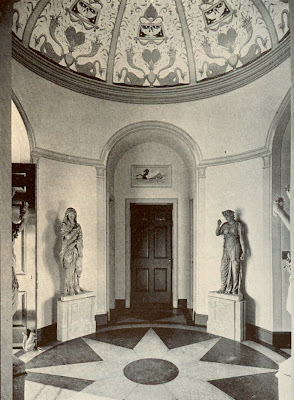 One of your very best moments, dear Dilettante!Bremo was referred to in James Fox's book about hisgrandmother Phyllis Brand (The Langhorne Sisters) but neither that book nor the biography of Mrs Lancaster ever gave a hint of what that marvelous house actually looked like.As for the hall at Mereworth, in recent years its richterracotta walls were subdued by a very un-Italianwatery green. >Maybe someone with a scanner will take pity on you and send aerial shots of Bremo with its various dependencies and outbuildings. It's actually much more impressive than those linked pictures suggest. 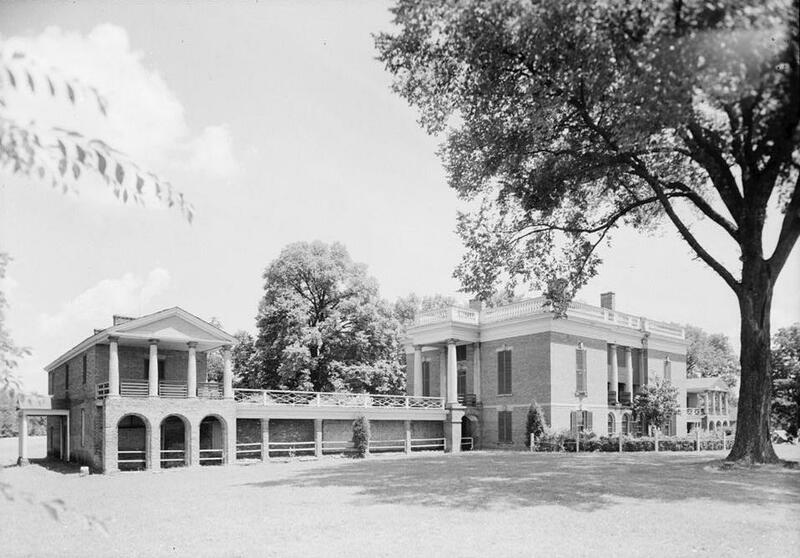 (My anti-Jefferson bias compels me to prefer Bremo's other two, somewhat eccentric residences to this one. And the Temple of Temperance, however misguided, is spectacular.)P.S. 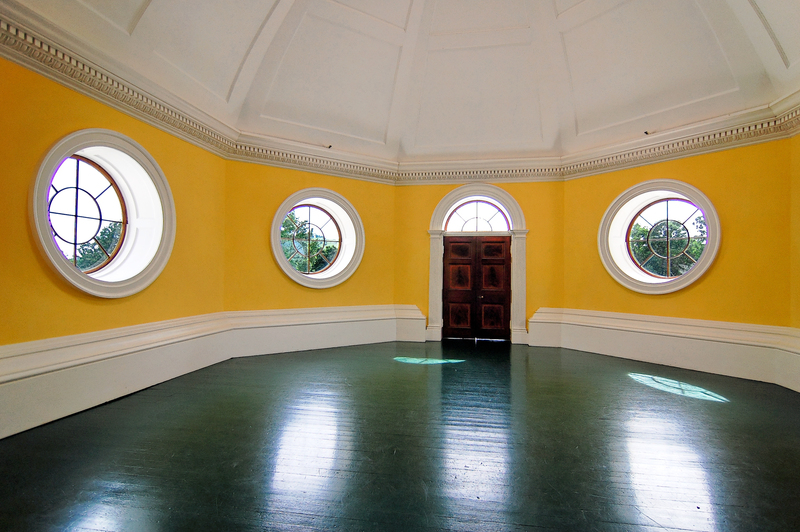 I don't understand why they haven't put a billiard table in Monticello's dome room. Are they afraid someone might try to use it? >"And the Temple of Temperance, however misguided, is spectacular. "You grab the Temple and I'll take the Barn out back, quick before the new owners arrive, uuup too late:Trophy wife whines to auto sales tycoon husband: "Huneee the columns are all messy and there are louvers missing on the front door, I cain't seeee anything out these windows, there aren't even any picture windows anywheres, why pay so much munneee when you cain't even see what you paid for, how do you expect to heat and cool this place with those ceilings so high, where is the hot tub, I think we should tear this thing down and put up something pretty…Magnificent post and links, Sir DED. I genuflect in your direction, as always. >I've learned my lesson well. I now read your blog on Saturday afternoons so that I'm free to spend as much time as I want on exploring the various links for more information. Thank you for opening my eyes to some beautiful places. 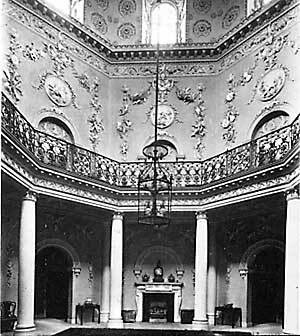 >Blue, neither you nor I have been to Chiswick House since it has been decorated. Perhaps someday before too long. >Blue, how do I love thee? Let me count the ways! This was a marvelous post full of sublime buildings, divinely connected by your superbly witty and erudite commentary. I was glued to the screen, drinking it all in. Would that one were only half so talented as thee! Bravo! >Bravo! !I'm a native Virginian and Jefferson is considered a god!! His retreat, Ashlawn, is amidst an extensive restoration and is quite note worthy as well. A trip to Monticello in Charlottesville will pretty much confirm to anyone Jefferson was a genius.Down here in Atlanta Philip Trammell Shutze is a well regarded 20th century architect. His home, Swan House, for the Inman Family is gorgeous, with the orginal Ruby Ross Wood interior which is incredibly rare. It's a must see on a trip to Atlanta as well as the other Shutze homes.A glorious spring weekend down here, it will be coming down east soon!! >Ah, a dome of one's own! Dollars to doughnuts there's more than a bit of "sacred geometry" going on here. Have you read A.T. Mann's Sacred Architecture? It's an engaging explanation of the geometry and symbols of sacred places. More a primer than a manifesto, it does make one contemplate why certain spaces "feel" sacred.ps snowing again: DRATS! >I read the Nancy Lancaster book earlier this year and loved it. But even more, I loved your little journey round the world and back! >One of these days, DED, I'm looking forward to you telling us you're hanging up the gone fishing sign, closing up shop + responsibilities for a week or 10 days, and heading off to get drunk on houses for a while. How about now. You've had a cruel winter, the news is bad, assholes with spare change are tearing down never-again houses, and you need to see Bremo. Get packed and get going. >Down East -Thank you! I knew that the Nancy Lancaster book would stimulate all sorts of tangents and digressions in your mind!! Waiting for more. No picture of Eydon for comparison??? >What a marvelous post to start my day! Also I, too, am reading Robert Becker's bio. of Nancy Lancaster at the moment. It is a very distracting book that's led me to other books in my library so it's been very slow going. I see you're going through the same mental exercises as well. Your connections still amaze me though! If you can do something like this in 10 minutes, I am truly in awe of your abilities. 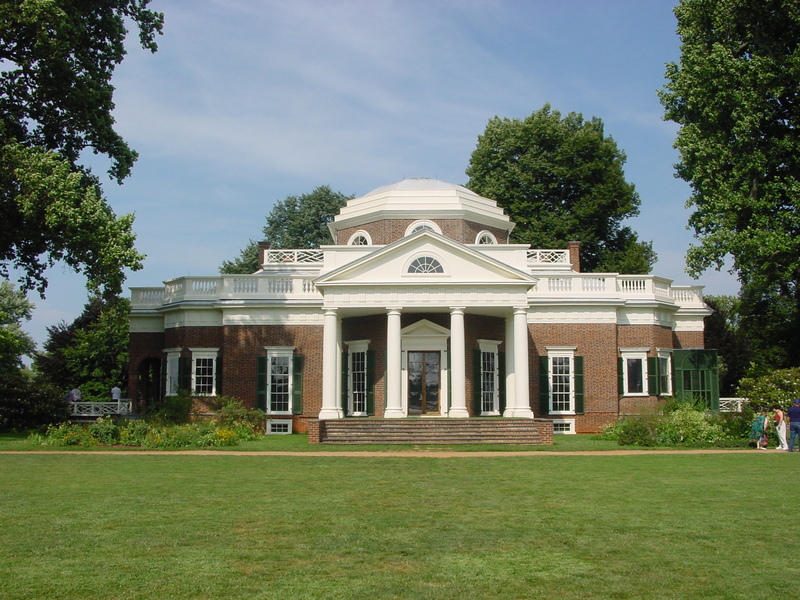 >Actually, Bremo looks more like Popular Forest, Jefferson's retreat in Lynchberg, VA then it does Monticello! It is so much like Popular Forest except that Popular Forest is an octogon and Bremo is a square, but the exterior of both look alike. 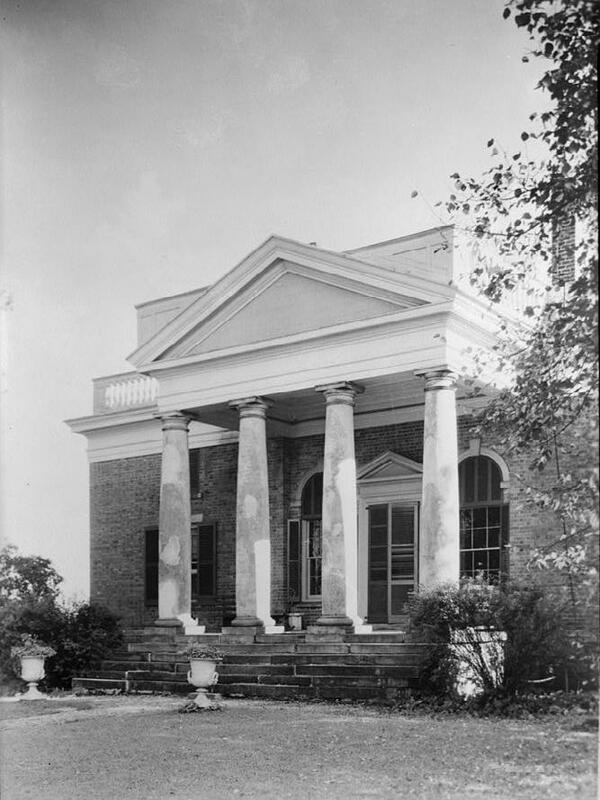 >Poplar Forest was a retreat, so it wasn't as grand as Monticello. And don't forget, Monticello was dramatically remodeled by Jefferson to it's present design. Popular Forest had the dependancys as well with the galleries. So great observation about Bremo. >And a rotunda tour it was!! Ha!! And I stand corrected, Popular Forest only has one dependancy. Would you consider allowing me to print a photo of yours in an academic book I am just completing?